Good Morning ! 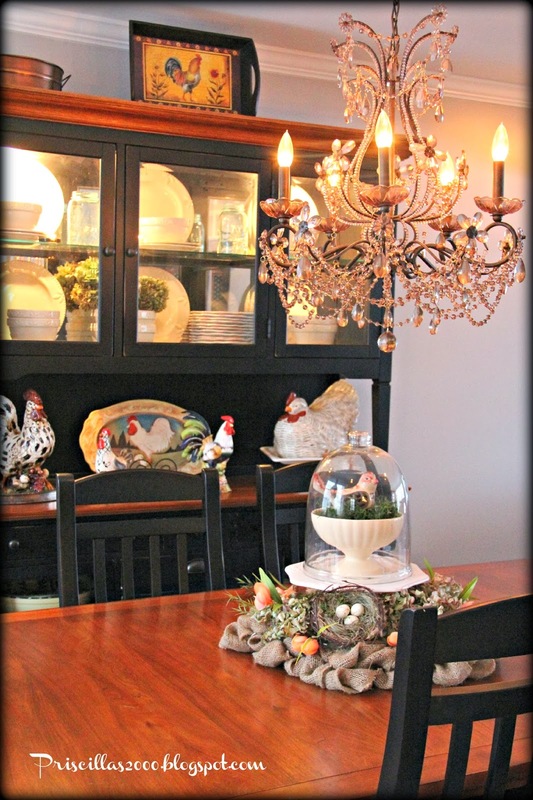 Another snowy day here in the Chicago suburbs.. but its springtime in my dining room ! 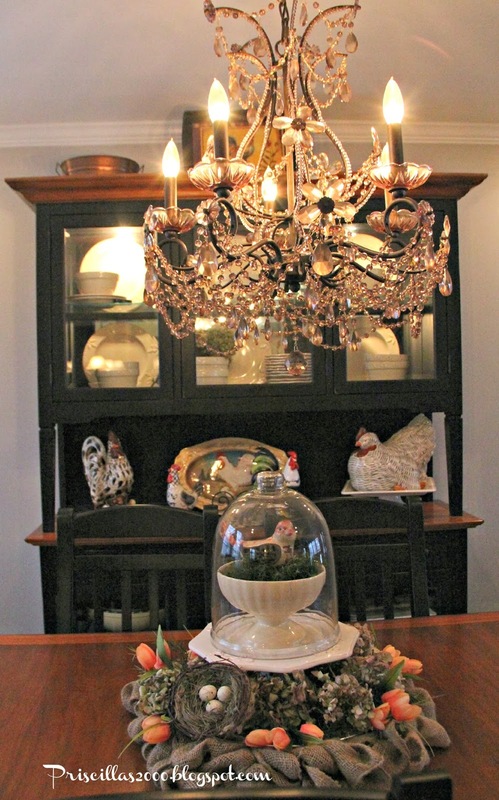 I love this vignette on the dining room table.. 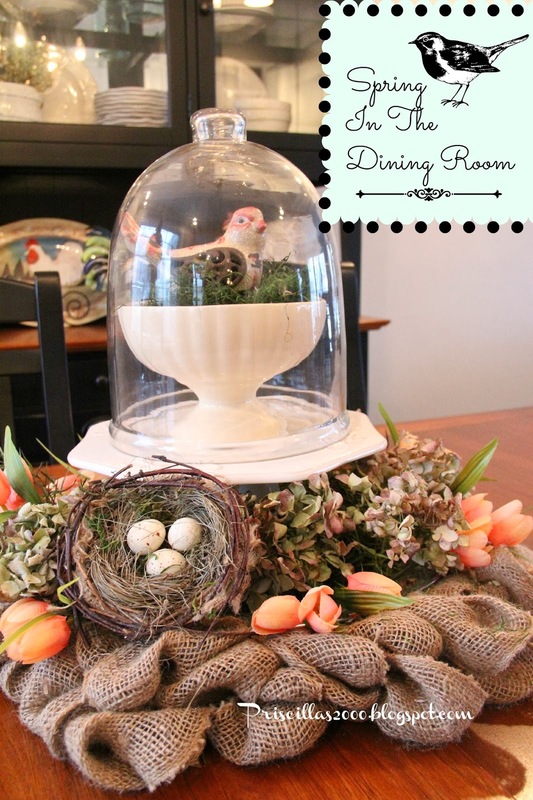 I used a burlap wreath with dried hydrangeas and tulips, a cream colored pedestal plate,a thrifted pedestal bowl filled with green moss and a bird.. topped off with a glass cloche.. and a egg filled nest on the wreath. 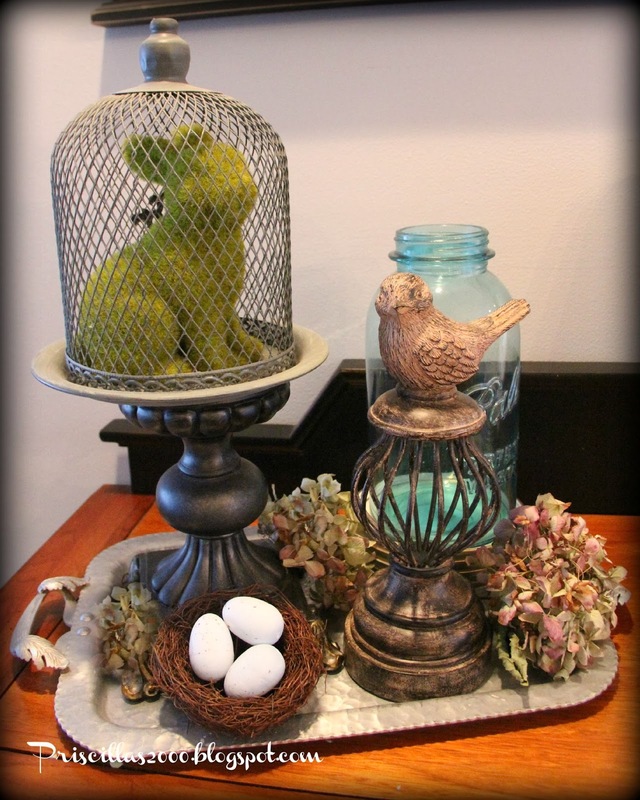 On the buffet I have a couple spring vignettes..love the moss bunny in the metal cloche.. got him at Hobby Lobby. 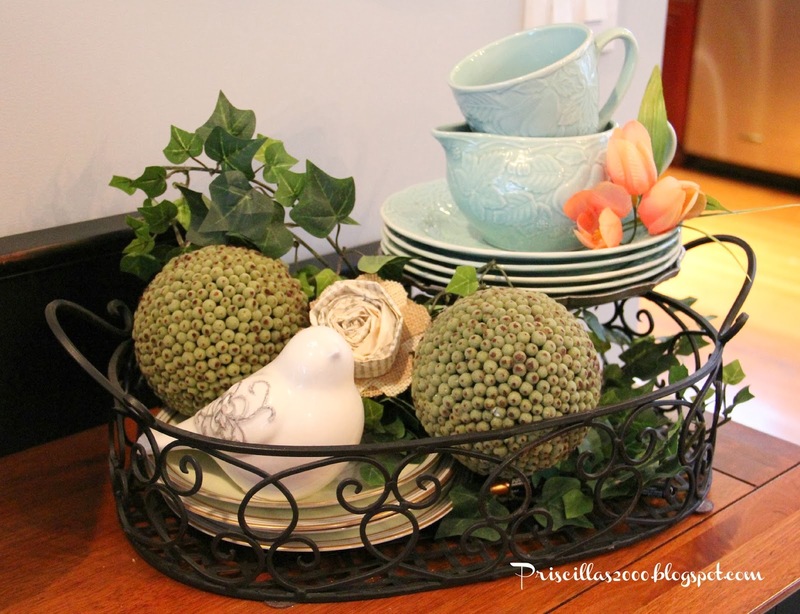 More dried hydrangeas , a vintage Ball jar , and a egg filled nest on a silver tray. Thrifted aqua dishes ( love them ! )a bird and some greenery in the wrought iron basket. I also added one of the rolled book page roses to the basket. The spring book page wreath hangs in the window. 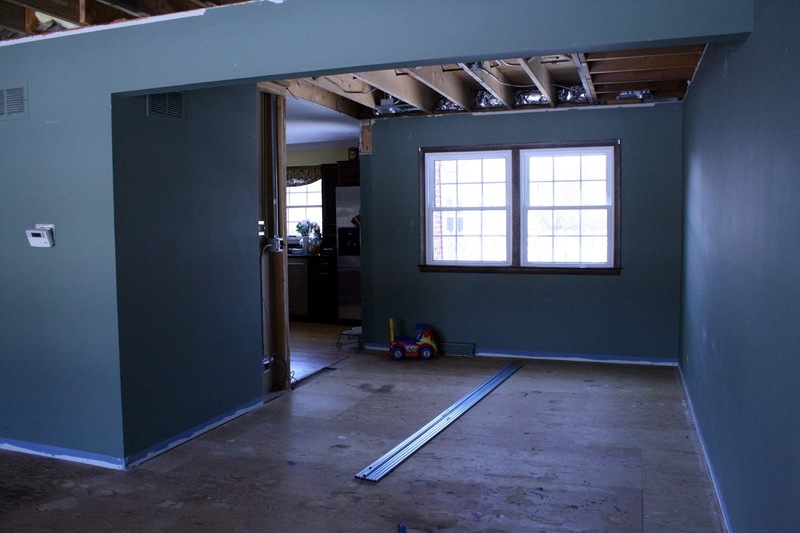 This is what the dining room looked like last year at this time! We still need window treatments, but I don't want to cover up the pretty window molding ! Thanks so much for stopping by! I appreciate all your visits and comments ! You've inspired me! I think I'm going to put spring in my home too! Pretty, pretty! I love the moss bunny too! We just got a Hobby Lobby, but I haven't been yet! I started to Springify my house a bit yesterday. Still working on it. Very pretty! I do love your table and buffet with all your pretties on them. I love Hobby Lobby.....Happy Spring! You are definitely an inspiration to all of us procrastinators! Your DR looks beautiful! Such inspiration!!! I have a few spring flowers in my home, but I must try harder!!!! Your dining room looks beautiful, I love your table decoration. Hope the snow goes soon. 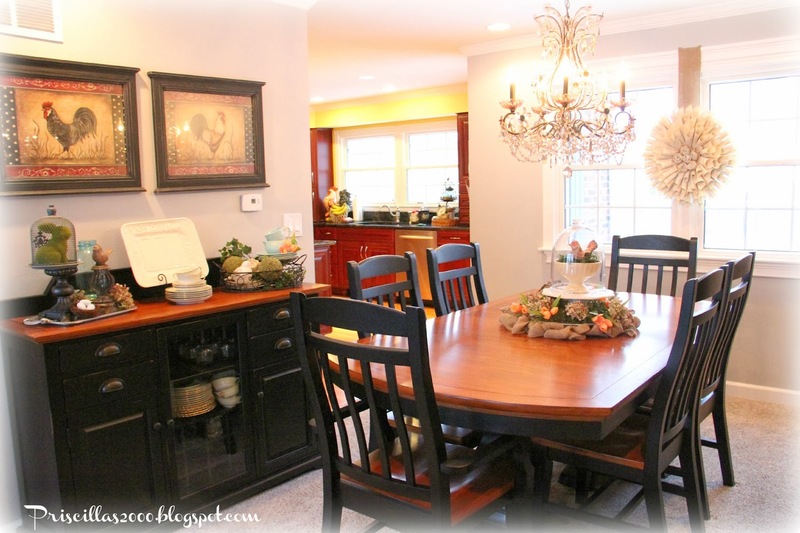 Your dining room is so beautiful, Priscilla! What a lovely transformation from last year. You have inspired me. 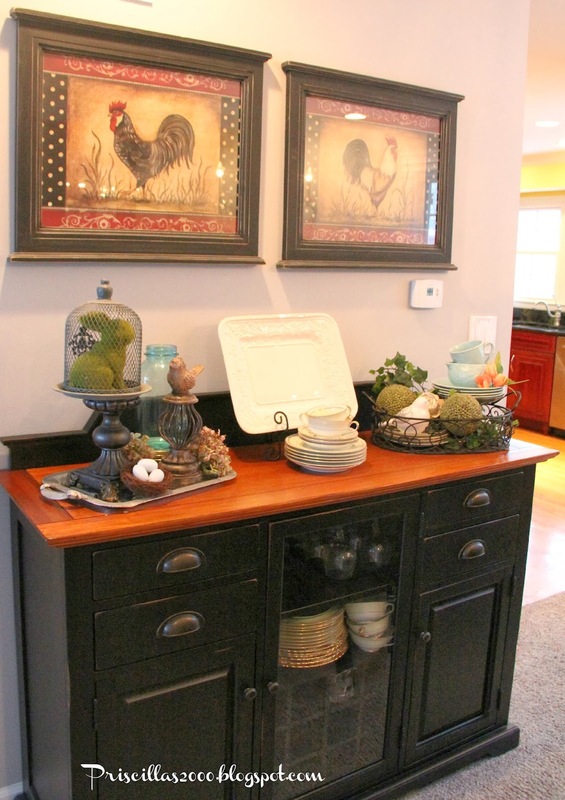 Love the fresh look with the bunny and birds which are always a sign of Spring. Very Spring indeed, I live in the South where things are actually starting to bloom outside but I need to get busy and bring some spring in! I love the ruched burlap in the center of your table. Hope the snow stops soon! Your bunnies are so cute and I love those blue dishes. The color is so pretty. Thanks for linking up to Tips and Tricks. Stay warm! 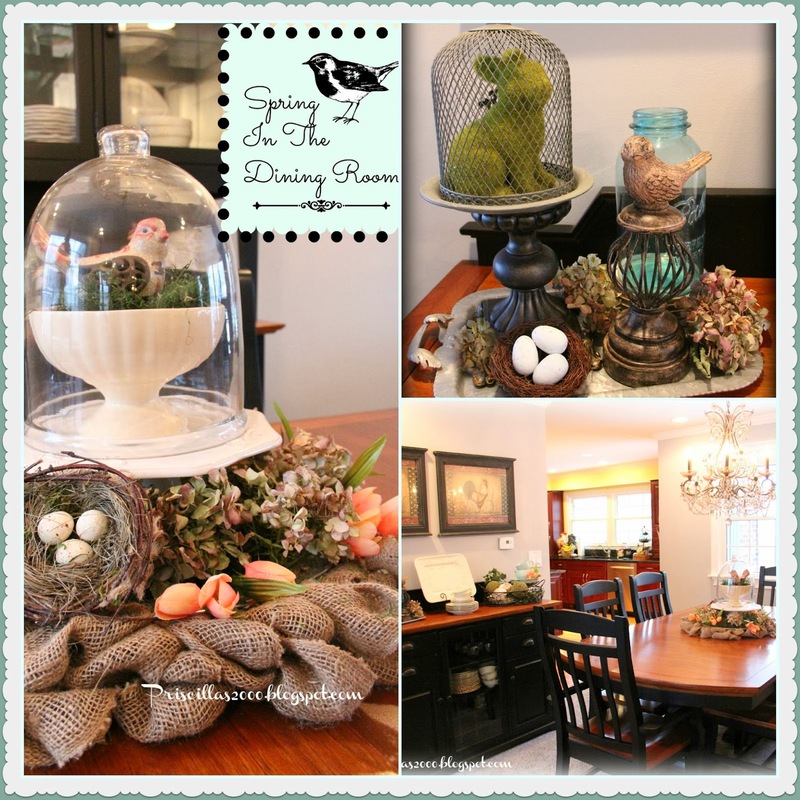 I am highlighting your beautiful centerpiece on centerpiece Wednesday tonight! Lovely! As always you have a wonderful idea here Priscilla! 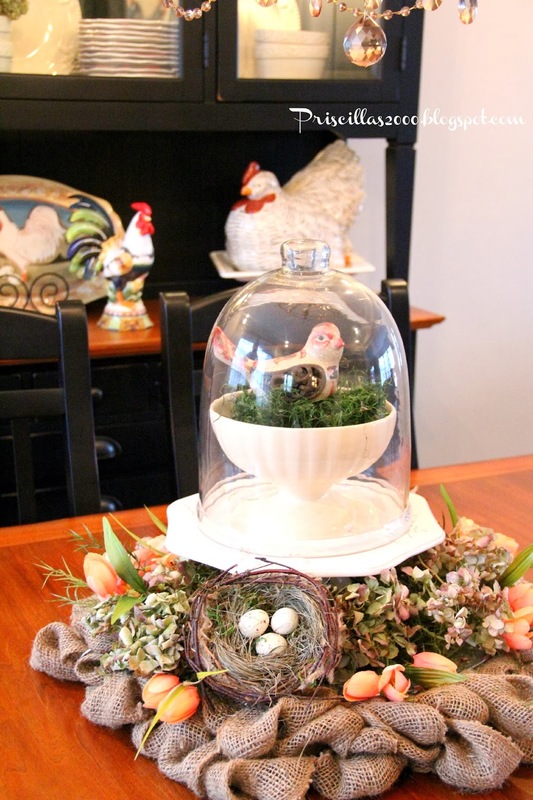 I like the glass cloche most, it reminds me of home! Everything in your room is amazing! Cool!